„Rică nu știa să zică” (“Rică didn’t know how to say”) is the story of thousands of children with autism, that pastel told together with actors Marius Manole and Andi Vasluianu during the rebranding campaign of The Applied Behavioral Therapy Association (ATCA) into Autism Voice. The need for a rebranding for ATCA and the name changing for the Association came after the 11 years during which the organization extended its efforts of recovery and integration of children with autistic spectrum disorder. The organization acts as an interface, adjusting communication in both directions between children and those around them, which leads to the demolition of the communication wall between the parts, while the new name and identity come together to support this. Autism Voice is the name ATCA chose in order to continue its mission, with pastel being responsible both for the rebranding process and its communication campaign. 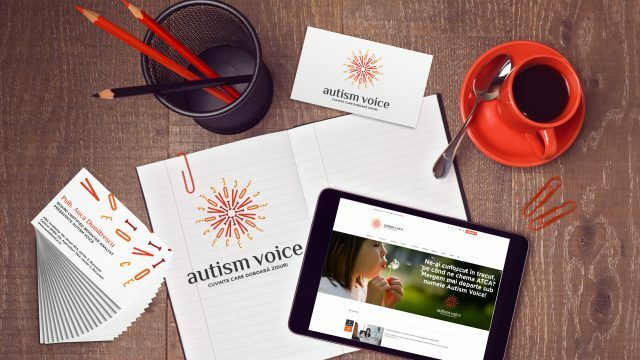 The visual identity for Autism Voice reflects the unique approach of the organization, which supports the therapy for autistic children, as well as the preparation of the ones they come in contact with (therapists, teachers, parents), thus addressing the issue from multiple angles at once. Hence, the new logo is a symbol formed by the letters composing the word “voice” arranged radially, which creates a circular, expansive shape, explaining the idea of spreading the message, or of a sound wave. The result is a powerfully shaped symbol made from apparently fragile letters. The colors are warm, while the font type is informal and friendly, yet clear and solid. The slogan “Words that tear down walls” supports the mission that Autism Voice has undertaken, which is neutralizing the communication barriers between children with autistic spectrum disorder and those surrounding them. Emotion is the word which best defines everything we’ve developed for Autism Voice, both in the rebranding process and in its communication. Beyond the reason for which we said YES to this project without hesitation, the Autism Voice inspired us with an energy, involvement, and love that gave us strength and force for a whole year. We thank the Autism Voice team for its trust, as well as to the actors Marius Manole and Andi Vasluianu for their commitment, as they stood by our side and helped us carry the new ATCA identity forward,”said Dana Nae Popa, Managing Director pastel. The collaboration with pastel came at a point when we needed an impactful rebranding campaign, one with a strong message, on par with the Autism Voice mission, which is to stand as the voice of the children with autism. We’ve met a team of people who were passionate about the process of transforming the new identity, who managed to encompass – both visually and in the conveyed messages – the essence of the whole recovery process a child with autism goes through. They succeeded in creating impactful messages that reached the hearts of the people, both those involved in the field, as well as those who need to hear the voice of children with autism,” also said Anca Dumitrescu, president of Autism Voice. The rebranding process concluded at the end of March, and was supported by a PR campaign with a powerful social media component right before the Autism Awareness Day. pastel is an integrated communication agency with more than 13 years of activity on the Romanian market, and over 5,000 projects developed both locally and for other markets. The agency’s portfolio includes clients from different industries, such as auto, FMCG, services, pharma, ONG, retail. Autism Voice was founded in 2008. It was the first association focused on the recovery of children with autism that introduced the possibility of specialized ABA therapist training in Romania, and currently it is the only institution in Romania offering BACB-approved (Behavior Analyst Certification Board) continuous training courses. Autism Voice has two therapy centers at its disposal, where children with behavioral disorder from the autistic spectrum are helped to recover by means of the ABA therapy. Furthermore, the members of the association are co-organizers of the ABA International Conference in Bucharest, an internationally-accredited event beginning with 2010.